Synthetic peptide corresponding to Human Visfatin aa 441-490 (C terminal). Jurkat whole cell lysate (ab7899) and human kidney tissue. Our Abpromise guarantee covers the use of ab58640 in the following tested applications. WB Use a concentration of 1.25 µg/ml. Detects a band of approximately 54 kDa (predicted molecular weight: 54 kDa). 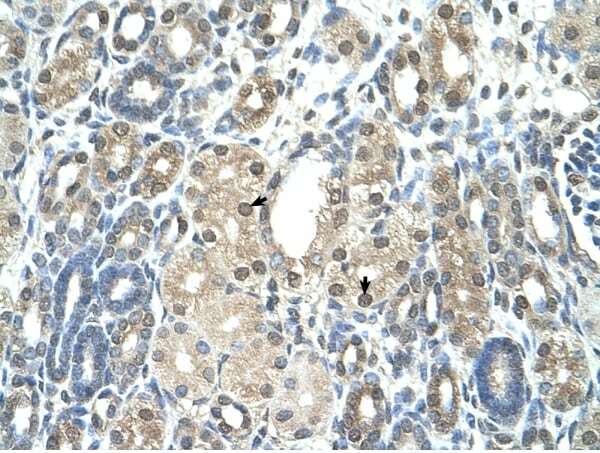 Good results were obtained when blocked with 5% non-fat dry milk in 0.05% PBS-T.
Immunohistochemistry (Formalin/PFA-fixed paraffin-embedded sections) analysis of human kidney tissue labelling Visfatin with ab58640 at 4-8µg/ml. Arrows indicate positively labelled epithelial cells of the renal tubules. Magnification: 400X. ICC/IF image of ab58640 stained HepG2 cells. 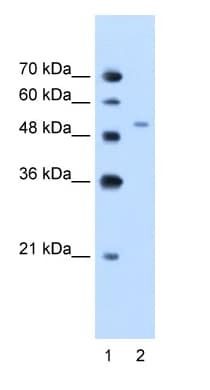 The cells were 4% formaldehyde (10 min) and then incubated in 1%BSA / 10% normal goat serum / 0.3M glycine in 0.1% PBS-Tween for 1h to permeabilise the cells and block non-specific protein-protein interactions. The cells were then incubated with the antibody (ab58640, 10µg/ml) overnight at +4°C. 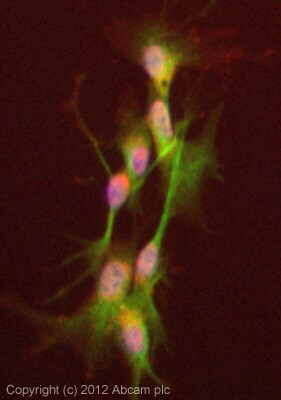 The secondary antibody (green) was for 1h. Alexa Fluor® 594 WGA was used to label plasma membranes (red) at a 1/200 dilution for 1h. DAPI was used to stain the cell nuclei (blue) at a concentration of 1.43µM. Publishing research using ab58640? Please let us know so that we can cite the reference in this datasheet. Thank you for your email. I apologize for getting the spelling of your name wrong. I will definitely send you the detailed protocol which I have been using. Thanks for sending the free vial. I have updated the address on the order, and it should arrive tomorrow. I look forward to receiving your protocol and hopefully resolving this issue. Thanks again for your information. Please let me know if you have any questions. Have a great day! Thanks for the help over the telephone morning. I was using the abcam ab58640 antibody for Nampt for IHC and IF. It was working nicely in 2009 but stopped working after that. We tried different lots but still there is no signal.Will it be possible to mail a sample of a working lot of Nampt to us. Your myosin 1 antibody works nicely for us. Thank you for your call yesterday and for your email. I'm sending a free of charge vial of ab58640 on the order ***, which should arrive tomorrow. This vial is from the same production batch as the first vial that you used in 2009 so I'm hopeful that it will work in a similar way. Please keep me updated about the results using the new vial, and let me know if you have any questions or if there is anything else that we can do for you.